The image that appears on the movie screen is the direct and tangible result of the joint efforts of the director and the cinematographer. A Hidden History of Film Style is the first study to focus on the collaborations between directors and cinematographers, a partnership that has played a crucial role in American cinema since the early years of the silent era. Christopher Beach argues that an understanding of the complex director-cinematographer collaboration offers an important model that challenges the pervasive conventional concept of director as auteur. Drawing upon oral histories, early industry trade journals, and other primary materials, Beach examines key innovations like deep focus, color, and digital cinematography, and in doing so produces an exceptionally clear history of the craft. 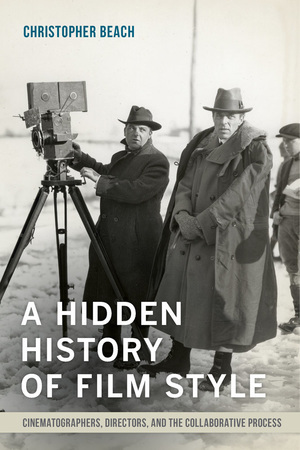 Through analysis of several key collaborations in American cinema from the silent era to the late twentieth century—such as those of D. W. Griffith and Billy Bitzer, William Wyler and Gregg Toland, and Alfred Hitchcock and Robert Burks—this pivotal book underlines the importance of cinematographers to both the development of cinematic technique and the expression of visual style in film. Christopher Beach is currently a Visiting Assistant Professor at Williams College. He is also the author of Class, Language, and American Film Comedy and The Films of Hal Ashby. He was named one of two Academy Film Scholars by the Academy of Motion Picture Arts and Sciences in 2013.